The GreenWorks products that you purchase have a ZERO carbon footprint. We'll say that again - our entire product line will never release an ounce of carbon emission into the air. 4 Year Warranty - Double The Industry Standard. When looking for lawn tools, we know you're thinking about quality. You're looking for something that will get the job done and get you back to your weekend. That's why GreenWorks backs every tool with a full four-year warranty - we know our products will perform at the highest level and always be reliable. GreenWorks high quality products are manufactured to last. That's why we back every product with a warranty that's twice the industry standard. 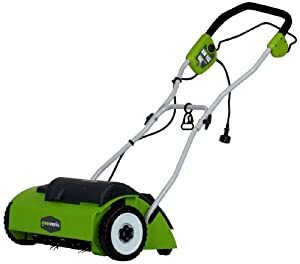 We'll provide all the power you need without polluting the air or forcing you to keep hauling your gas can to the nearest station (especially in the middle of a mow). No more tune-ups or maintenance. No more emissions. Fifty-four million Americans mow their lawns every weekend, according to the EPA, using 800 million gallons of gas each year. Along the way, homeowners spill more than 17 million gallons of gas while refueling. That's equivalent to the 1989 Exxon Valdez disaster. It's time to move beyond clumsy, harmful gas-powered mowers. It's time for GreenWorks to be your lawn tools for life.